One of the things that I really liked about Wayward Pines was how Crouch jumped right into the thick of the plot. He immediately sucked you into the story and had you wondering what was going on. Dark Matter is no different. As soon as you open the book, you need to fasten your seat belt. Crouch quickly whisks you away into an adventure that will have your mind racing. The second thing I liked about Wayward Pines is how Crouch leaves you guessing long enough to build the suspense, but doesn’t keep you waiting too long for the twist. Why is this a good thing? It lets you start wondering where Crouch will take the story. 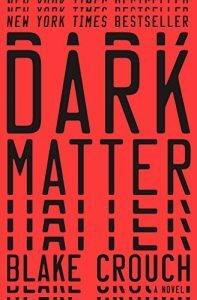 In the case of Dark Matter, it thoroughly bends your mind thinking about the possibilities. Some of them make sense and turn out as expected. Then there are the twists that will cause your mind to simply explode – in a good way, mind you. The third thing that is similar between the books that I really enjoyed is that Crouch uses elements of science to make the stories plausible. In the case of Dark Matter, he relies on quantum theories which is what really warps your mind. A little far-fetched, maybe, but still, plausible. It will have you playing a lot of ‘what-ifs’ during and after you’re done reading it. I’m sort of making it sound like the books are very similar, which they’re really not. Well, the writing style is similar, which you would expect from the same author. The plot, on the other hand, is not similar. You can easily enjoy both books, even if read back-to-back. I’m not going to dive into the plot or give anything away. There’s plenty online regarding the book, and the description on Amazon is enough to get you started. I’d advise staying away from any spoilers so you can fully enjoy the story. The verdict? Dark Matter is a Must Read. It’s my top recommendation for your 2019 reading list. In fact, it’s the most entertaining book I’ve read in the last two years. If you’re into a suspenseful thriller that will bend your mind and stretch your imagination, read it. You won’t regret it.